I just found this while researching for an interview, it’s from February 28, 2008…guys, it still fits,even though I am in a new place in my truth. I still need the Mother and the sisters, I still sing the battlecry to remind me every now and then…and I still adore Maria…and my face looks like this A LOT. …and I still wish I could have this ring tone. 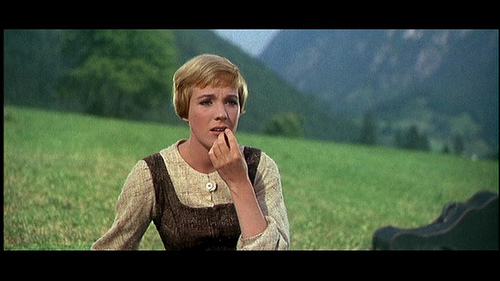 Whatever problem you have, I promise you the Sound of Music can fix it. Feeling blue or scared? Just think of your favorite things. Needing someone to take care of you? Are you feeling unable to face a world of men? Find someone 17 going on 18. no scratch that, just someone older and wiser. Don’t quite fit in? It probably means it’s time to go climb every mountain, just ford every stream. Never give up on your dreams. Feeling unsure of yourself? Despite what you see, I have confidence in me. It’s nothing the Mother Superior, an old carpet bag and a new adventure can’t fix. Some where along the way I started to tell myself some lies about who I am. It’s so easy to do really, sometimes all it takes is one crappy experience as a kid or a particular placement in your family, a situation you find yourself in, just one little thing that you allow to sneak into your heart. Once you start to believe and invest in these untruths, they become bigger and hard to shake. We often struggle, endure, grieve, create space, make peace and embrace whole parts of ourselves that were never true in the first place. This makes climbing mountains and fording streams feel damn near impossible. You forget that dreams exist, or they feel a million miles away. Sometimes the only way to rediscover who you are is to leave everything else behind, or start to peel away one layer at a time until you can see again. This requires it’s own sort of endurance, it’s own new space, it’s own struggle in the adventure. So my truth is coming to the surface, the light is bright and hopeful but what do I do with all the lies? They are gone from my head but they hide in my heart. This my friends, is when you claim the battlecry…and you listen on repeat, on repeat, on repeat. Can you believe it’s available in a ringtone and my phone won’t support it? It’s a tragedy! Just waking up on Memorial Day, glad to be off, checking emails and I so see myself in this post. I haven’t seen The Sound Of Music in a long time – very wise words I will keep with me today… “This requires it’s own sort of endurance, it’s own new space, it’s own struggle in the adventure.” Once again, thank yo Patience! Loved this!! Thank you so much! Have you ever heard of Carrie Newcomer? She has some really beautiful song lyrics about sisterhood I think you would like. my favorite movie! It was playing *constantly* in the background of my childhood!